MONCTON, N.B. 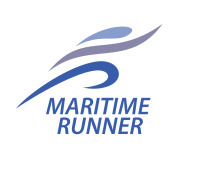 – New Brunswick runners gathered here last night to celebrate another year of road racing in the province, and to honour some of their top athletes. The annual Run New Brunswick awards banquet also saw two more athletes added to the Run New Brunswick Hall of Fame, as Michelle Cormier and Jacqueline Maillet were inducted in front of the large crowd at the Tide and Boar pub. Runners of the Year were 70-year-old Raymond Caissie of Richibucto-Village, and Shelley Doucet of Quispamsis. Caissie threw his arms in the air when his name was announced, surprised to receive the honour. 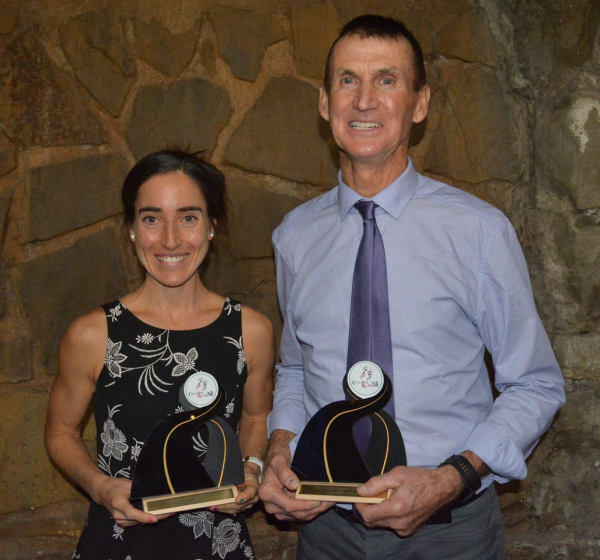 Shelley Doucet of Quispamsis and Raymond Caissie of Richibucto-Village were named Runners of the Year at last night’s annual Run New Brunswick awards banquet in Moncton, N.B. Caissie has enjoyed an incredible year of road racing, putting up 5K times that most 20- and 30-year-olds would be thrilled with, and also tearing it up in distances like the 10K and the 1-mile. In August, he set a new national record for his age group in the 1-mile, with a 5:54 in Miramichi on Aug. 12, only to break that very record with a 5:47 one week later on the same course. He credited his success to an active lifestyle, which sees him busy working construction for much of the year, and with cross-country skiing in the winter. He also thanked Paul Thibodeau of Moncton, who pushed him to some great races this year. It all added up to a great 2018 for him. It was Doucet’s second straight year receiving the female Runner of the Year honour, as she continued to rewrite the province’s record books. Her results included a new provincial half marathon record 1:17:10 in Houston in January, a new provincial marathon record of 2:38:49 in Chicago in October, and plenty more in between. She said it was an honour to have her hard work recognized. Whether it was her family being there for her at almost every race, her training partners for pushing her in her workouts, or her sponsors for providing her with nutrition and gear, it “truly takes a village,” according to Doucet, who congratulated all her fellow athletes. RunNB Outstanding Contributor – Daryl Steeves (Saint John).